Today is Bread Baking Project Day! 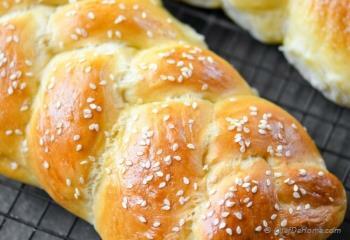 Sharing with you homemade, moist, lite, and scrumptious Braided Challah Bread with step by step pictures. 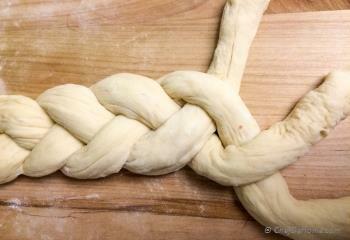 Also some words of wisdom (personal experience) on making Braided Breads! In my opinion, bread baking at home, is the most satisfying cooking adventure! I think, I write in my every bread post that I feel the joy of a 3-years-old-getting-Lego-Castle-stand-Upright when I see a soft and fragrant bread emerging from my oven! Traditional Braided Challah bread was in my to-cook-backlog since long... Last week, I decided to complete the project, no matter what! Here is one thing with bread baking, you (at least I) are scared of going wrong more than once. Baking a bread takes about half day of work (at least), and every-time you get it wrong, you have wasted half-a-day! So whenever I start with a new variety of bread, I always stick to what I know will work best. All breads can be started with basic yeast-flour-water ratio, then fat, salt and sugar, and then extra flour to manage the added liquidity, varies based on what kind of bread you are trying to make! If the base ingredients and raising temperature are kept consistent, 90% chances are you will have good soft and delicious bread. 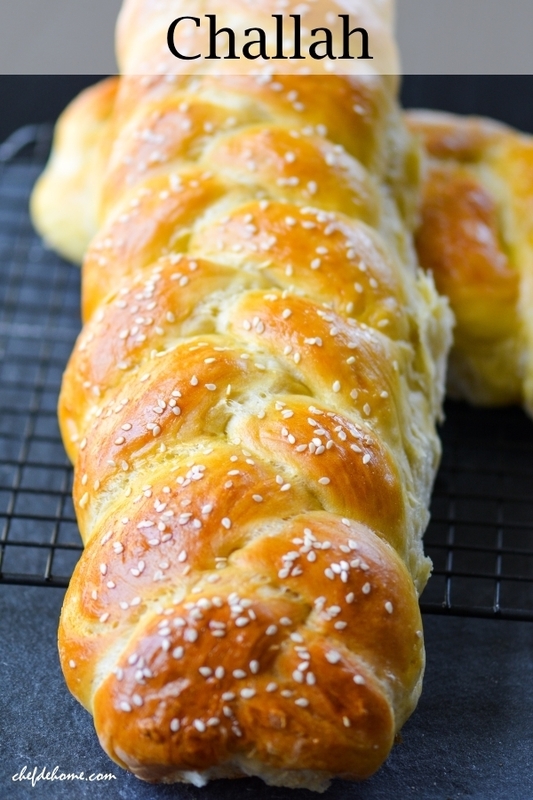 I'm sure you will have all ingredients used to bake Braided Challah in pantry! Right now! Same old all-purpose flour, eggs, sugar, yeast, oil, and some labour of love! :) Ya ya, I hear you, many people claim using ONLY bread flour for breads! but you know what! I only bake with unbleached all-purpose all the time. and look at the bread, it is no less than a perfection! Bread flour may have high protein hence high gluten to make bread better! All purpose does the good job too! Why not Bread Flour? Well, I'm a spontaneous cook! I don't have time and space to hoard bags of bread flour in anticipation of making breads! Indian kitchens already need space for Dried Lentils, spices... and so on... So, when it comes to traditional breads, only two kinds of flour exist in my home, All-Purpose and Wheat Flour! (and sometimes buckwheat!) That's what I think on March 6, 2015! If my view changes latter, you will know first! promise! Speaking of which, I have to tell you, I have not yet gone extra-mile to make a wheat challah bread yet :) But... I promise to try! Instead of making one huge Challah, I decided to make 3 mini rolls! and they are not that small either! I expected them to be, but they are not! When I was rolling Challah dough for braiding, I decided to make two traditional Challah and one Breakfast Challah. 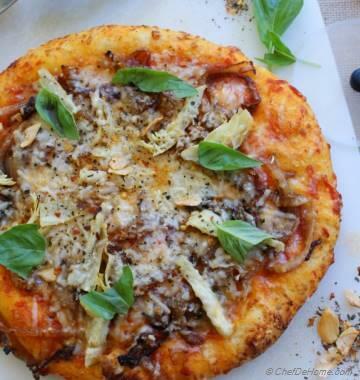 I will share the recipe with you soon! Here are some Words of Wisdom, if you planning to take this project this weekend!! I'm telling you will be happy if you do! With weather showing so much colors all over the country, it is so hard to depict what the weekend will be like! It is almost spring and it is still so cold and snowing in many parts of country. On the contrary, it is 80 degrees here in San Diego-LA! So, what I'm saying is if you are uncertain about what you doing this weekend, you can sure stick at home and bake this delicious bread! What ya say? Interesting! Isn't it? Okay now, no more chit-chat, straight to words of wisdom! 1. 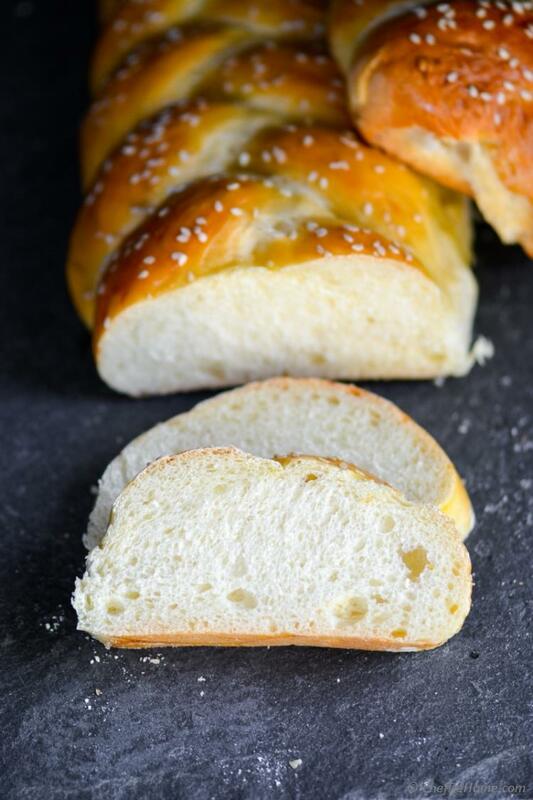 If you have never made braided bread before, practice braiding on a simple dough or with 3-piece of plastic-bags to learn and get it right first time! Trust me, I have wasted dough on this in past! 2. While rolling long ropes for braids, don't be too gentle! Roll it with nice hand or braid will not look good. Also when braiding, make good (slight tight) braids Or braids will be all-over the bread. I mean will not be neat. 3. Brush the bread liberally with egg-wash then put plastic wrap or plastic wrap will stick and when you pull it away, it messes up the braids. 4. I recommend (not mandatory) to make three small Challah instead of one big one! Why? First, you can eat one and freeze two or gift two if you prefer or vice-a-verse! Second, if you don't get first braids right the first time, you can make the second two correct :). 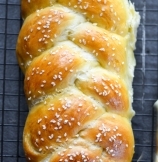 Third, you can make two traditional braided and one breakfast Challah! Recipe coming soon! All I have to say now, is.... Oh Dear Challah, I love you! Can't wait to bake you again! Soon! 1. 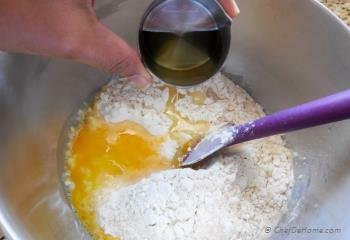 In a wide bowl (mixer bowl), add lukewarm water and mix in 1 tbsp sugar. Now sprinkle yeast on top and let bloom for 10 seconds. If yeast does not bloom, start again with fresh yeast. 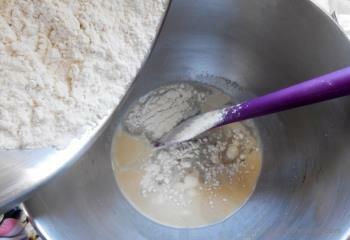 Once yeast has bloomed, add in 3 cups of flour. 2. Followed by salt, remaining sugar, beaten eggs, and oil. 3. Stir with spatula to combine. 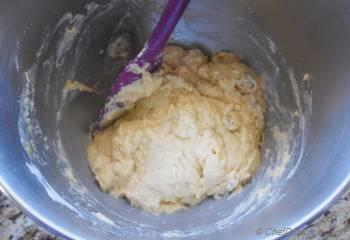 Dough will have sticky batter consistency. 4. 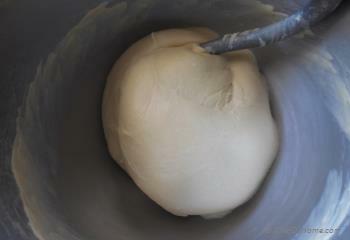 With paddle attachment on low speed, add 1/4 cup flour at a time until dough leaves sides of the bowl. 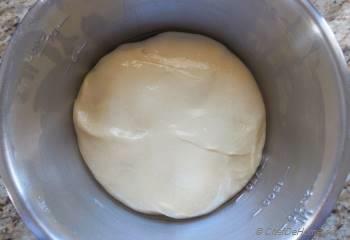 Now shift to dough hook and knead for 5 minutes. 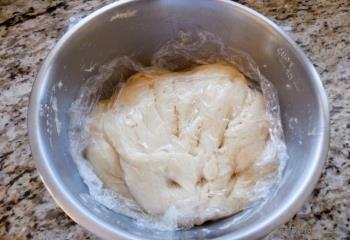 Or transfer to a flour dusted work surface and knead using stretch and fold action for 5-6 minutes. 5. Transfer dough to oiled bowl, flip to coat. 6. Cover and set aside to rise for 1.5 to 2 hours until doubles in size, at room temperature. I kept it little longer. Not intentionally, but I got busy with other stuff. So it not just doubled but was + half more in size! 7. Once risen, punch down, flip again, cover, and leave to rise again for 1 hour. 8. 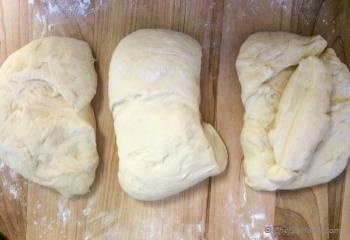 After one hour, transfer dough to work surface and divide into 3 equal pieces. 9. Cover two parts with cloth. Divide one remaining part to further three equal portions. Roll each portion to a 1 foot long rope. 10. 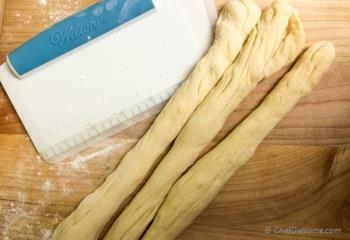 Braid the three pieces of long dough rope sealing both edges tightly inside. Repeat steps 8-10 with remaining two cloth covered portions. 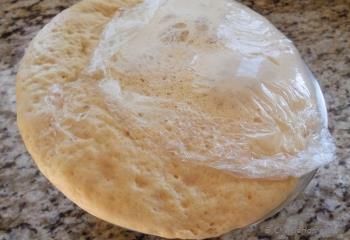 Transfer braided dough to sheet pan. Brush with egg wash and cover with a plastic cling wrap, then with dry kitchen towel and set aside to at room temperature until doubles in size (40-50 minutes). Don't throw away remaining egg wash yet! 11. Pre heat oven to 350 degrees Fahrenheit. Remove cling wrap and brush egg wash again. Sprinkle poppy seeds or sesame sees on bun per your liking. Bake until golden brown and bread sounds hollow when tapped at the bottom, about 35 to 40 minutes. Transfer to a wire to cool completely! Shubha, do try! I'm sure you will like baking Challah! I will wait for the feedback! Rachna, thanks for stopping by! Challah is a very delicious bread. I bet you will love it! Looks awesome Savita! So funny you posted challah yesterday and I also posted a similar bread! Love it! 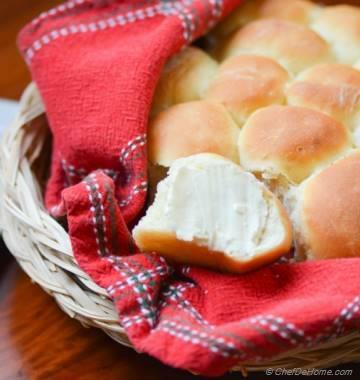 Will definitely try it, since I love homemade bread! :) true! I'm a huge fan of homemade breads myself, Mira! Do try, challah came out moist and very delicious! 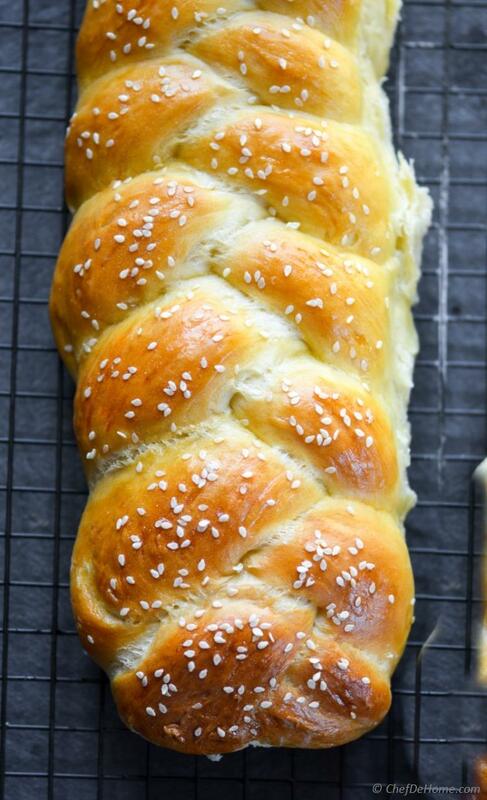 Such a gorgeous challah, love that you topped with sesame seeds. Cherry, thanks! Sesame seeds were indeed pretty good! You are welcome my dear! No one can escape from magic of challah! It looks so captivating! Isn't it? A must bake! Do try! wow!! 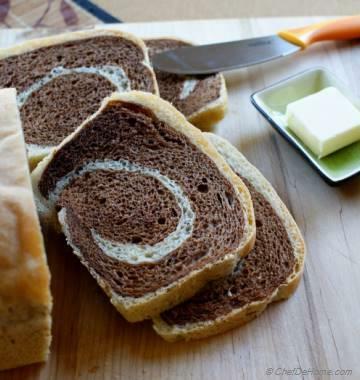 this bread looks so good, Savita! I have never seen one before! thanks for sharing. Neeli :) thanks! Challah is a traditional Jewish bread. Very famous! Often it is heavy in eggs! I have tried to make a little less-heavy version! Still tastes great! try sometime, you will like it!